Some time last year, I visited the original branch of Yalla Yalla in the heart of London's red light district. A tiny little place with about 8 tables huddled closely together, dimly lit and manic service. It always struck me as slightly ironic that a restaurant with a name like Yalla Yalla, meaning "hurry up", was so slow with so few people to serve. Decent food couldn't quite make up for the fact that the whole experience was quite off putting and the first Yalla Yalla fell on the blog scrap heap. Almost a year down the line, another branch has opened, this time just north of Oxford Street, a considerably less seedy area of town. The restaurant itself has had quite a transformation as the number of seats appear to have mated like rabbits and have multiplied considerably. The decor is modern with shared tables and bright lighting, nice but not filled with the character of their other restaurant. 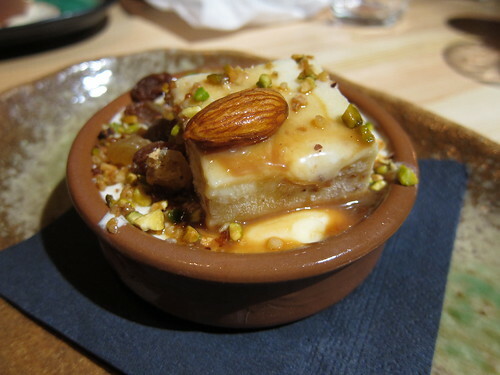 I still had high hopes, as the food was always decent, and this time round, the service was excellent, with waiters flitting around and always greeting you with a big smile on their face. The food was pretty much the same as before, still pretty decent. On both occasions (I seem to have visited twice in a week), we plumped for a selection of mezze, which I guess is the order of the day in a Lebanese restaurant, although there were also a wide selection of larger dishes too. We got busy with the ordering and ended up with dish after dish being brought to our table in quick succession. No long waits here. 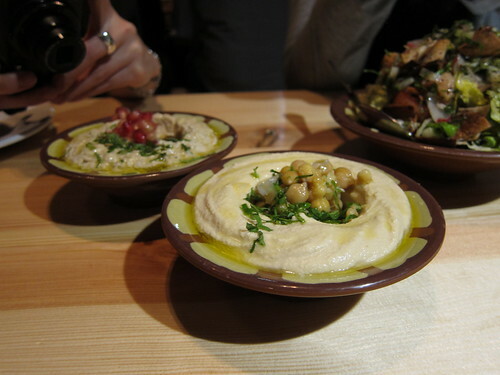 The hommos was excellent, and I have not alwyas been the biggest fan of chickpeas, whereas the baba ganoush was pleasant, if not quite as smoky as I would like. 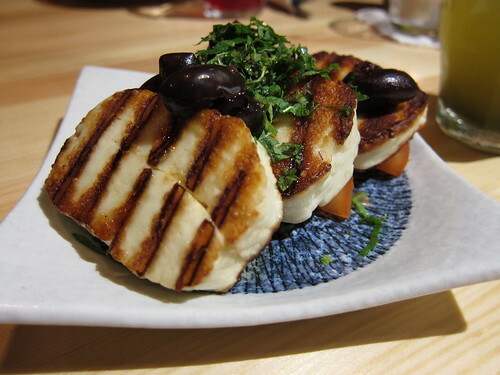 Halloumi, always a personal favourite, was well charred and went surprisingly well with its olive and mint garnish. The meat dishes revolved around variations of lamb and chicken, with a stuffed lamb bread drenched in lime and pomegranate molasses probably my favourite dish. 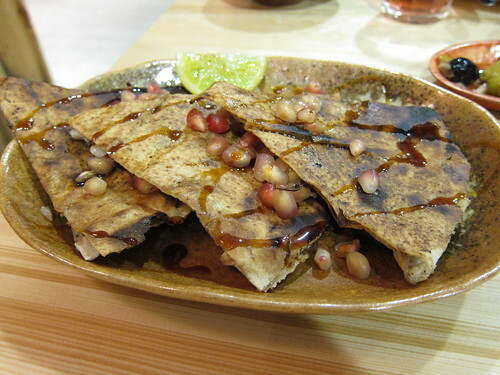 The slices were light and thin, with lime and pomegranate molasses adding a sweet and sour tang. The chicken livers were also served in the pomegranate molasses, and even though I have quite a dislike for livers, these tasted highly astringent. The lamb tartar was also very disappointing as it had suffered from a heavy hand with the seasoning, although when highlighted to the staff, this was whisked away and removed from the bill, with some assorted pastries sent over to say sorry. The whole meal came to under £20 each, which is pretty good value for the food that we had just eaten, but I couldn't help but feel that a charming restaurant in Soho (albeit with massive faults) had turned into a restaurant ready to be rolled out across the country. 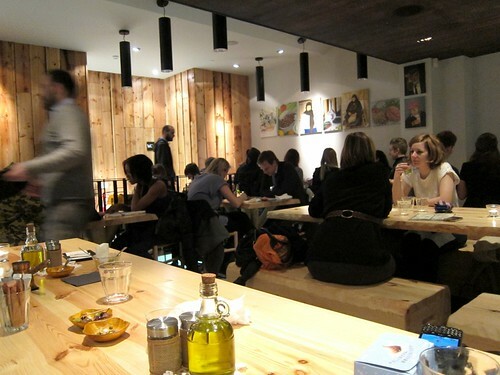 I would definitely happily return to Yalla Yalla, and it's ideal location just off Oxford Street should keep business ticking over steadily. Thanks for the reminder. Cheers! That lamb stuffed bread sounds superb! Tried this branch of Yalla Yall twice..but I left a bit disappointed the second time..The lamb meat was very dry, the chicken livers in pomegranate juice, were a bit sour..Will try it a third time..just to decide on a white or black ball. @ London Chow - For a hater of chickpeas, I am very particular about my hommos, but I am glad to report that this was lovely. @ Lizzie - Expensive? I think the mezze is reasonably priced. I have been twice, and didn't pay more than £20 a head for plenty of food. @ Raluca - I totally agree. The chicken livers were strangely sour, but the menu is quite varied and most of what I have ordered there was really good. @ Pavel - No doubt there is better (and probably more authentic) Lebanese, but I think you hit the nail on the head, it's location is a major advantage. @ Mzungu - It's all in the ordering I reckon, especially as the menu is so varied.